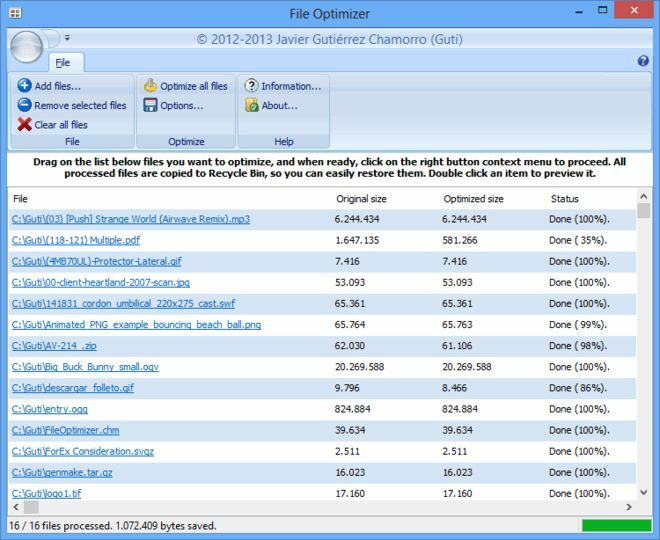 FileOptimizer is a lossless file size optimizer supporting AIR, APK, APNG APPX, BMP, CBZ, DOCX, DLL, EPUB, EXE, GIF, GZ, ICO, JAR, JPEG, MNG, MP3, MPP, PNG, PPTX, ODT, OGG, OGV, PDF, PUB, SCR, SWF, TIF, VSD, WEBP, XAP, XLSX, and ZIP file formats among others. It keeps the behaviour of the file untouched, but with its size reduced thanks to several recompression and optimization techniques. Several third party tools integrated in one same tool (plugins). Drag the files you want to optimize to the files grid in FileOptimizer, right click with the mouse to open the contextual menu, and then click on Optimize. This will process all supported files added, and overwrite them with the optimized version. Alternatively you can add the files and directories to process on the program's commandline, or dragging them to the executable file. FileOptimizer will remove additional metadata, and other unneeded information, so if you want to further modify the original files, remember to create a backup of them.